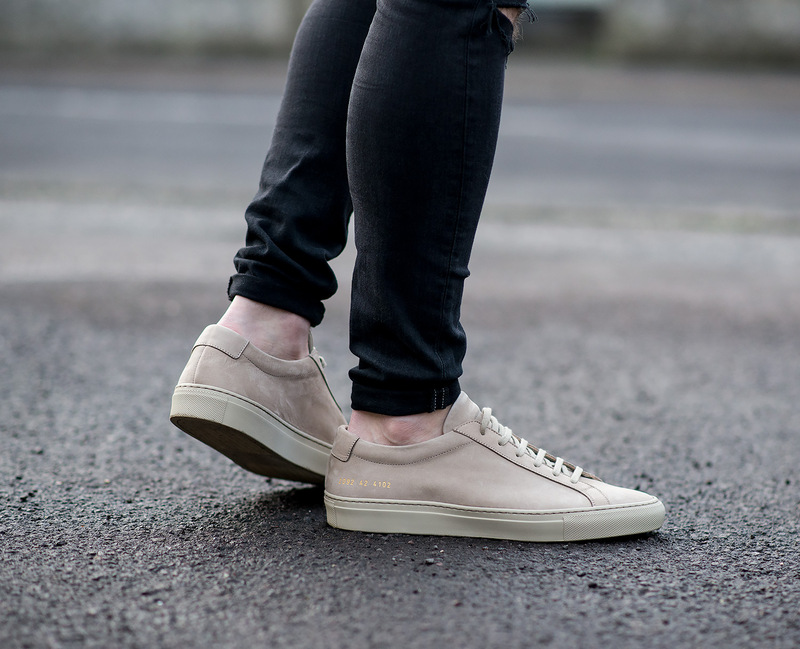 Common Projects Achilles Sneakers have been around for as long as I can remember, whenever I browse my favourite online retailers, I am always bombarded with their newest selection of colours and designs! I always promised myself that one day I would give the low top versions a thorough test drive, enabling me to compare them to my beloved Saint Laurent Court Classics (which bare an uncanny resemblance). The pair I will be reviewing is a style I had been keeping a close eye on since they debuted into the stores last year, rather than my usual impulse purchasing, I held my ground till they were discounted to a more manageable price point! This is not the first time I have owned a pair of Common Projects, I used to be the proud owner of multiple pairs of their high tops (long before I became obsessed with skinny jeans!). So, let’s get down to business and on with the review. 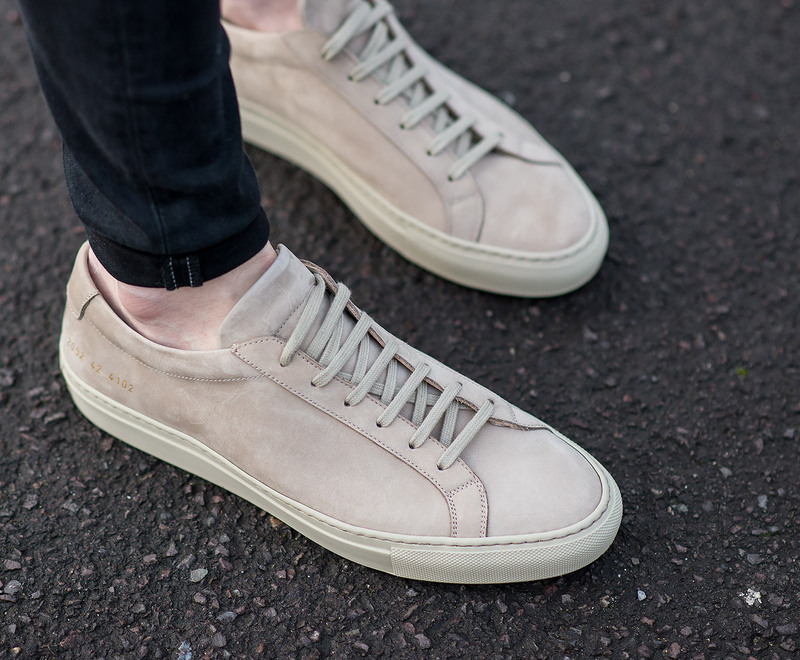 There is not a single doubt that the Common Projects Achilles shape is very desirable! Their worldwide popularity is a testament to how perfectly designed the shoe is. They are sleek without appearing too aerodynamic, yet still boasting a pointy shape than the more common round toe cap feature on many of its adversaries. Personally, I am drawn more to this sharp design, allowing an appealing outfit silhouette. Overall, ascetically, Common Projects are faultless, this model has been a brand winner for a long time, and I can see no reason to dispute that! The sneakers are always available in a vast array of colours, almost offering the full spectrum of colours. Yet, despite this, they are always tasteful and rarely vulgar or garish. Each season the Italian brand produces a number of limited edition shades, along with a much larger amount of their classic and timeless colours. For this review, I chose a beige pair ‘off white’ crafted from a very soft nubuck. 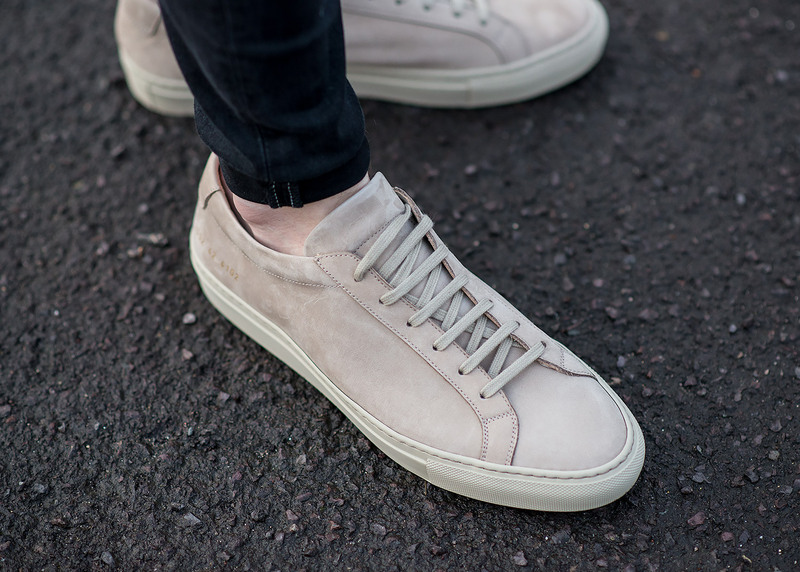 Thanks to their classic and understated design, the Common Projects Achilles Sneakers are easily paired with almost any outfit you can throw at it! My personal preference would be one of my favourite looks – a Bomber Jacket and Skinny Jeans for a cool street style ensemble! When it comes to comfort, unfortunately, the shoes falter somewhat. They slip on nicely and at first, there are no issues, particularly on the sides of my feet (one of the first telltale signs of forthcoming pain). But after a short amount of time, the notorious irritation begins to appear along the heel. Initially, it starts as a relatively mild concern, yet within a couple of hours, red marks begin to appear on my skin and discomfort begins to raise its head. Your mileage may vary if you wear thick socks, but I always wear the low profile variety, often I choose to go sans-socks entirely. Nevertheless, it is still something to be aware of. As usual, I chose my standard footwear size for the Common Projects, which is an EU 42 / UK 8. As to be expected, they fit perfectly just like all of my sneaker collection. The brand actually recommends you size down one from your normal shoe size. However, in my experience the majority of designer brands adhere to the smaller shoe mantra, if you have ever owned a pair of premium sneakers before, I would whole-heartedly recommend you choose the same size. The shoes are safely packaged inside a sturdy, solid and gleamingly glossy white box. One single solitary logo branded along the top of the lid, the remainder of the box sparse and plain (except the compulsory sizing and model number sticker, affixed to the short edge of the box). Inside, you will find a large amount of protective tissue paper, ensuring each shoe is kept safely apart from each other. There is a single, yet admittedly large dust bag included (I prefer 2 though, to store each shoe individually) which is of very high quality. In recent years, £300+ appears to be the current benchmark for a lot of premium sneakers. When it comes to value for money, this will largely depend on whether you can justify that high price point, especially on a simple, minimalist design. The shoes are produced to an incredibly high level, with high-end Italian production values. Many high street stores offer similar shoes for a mere fraction of the cost, but in my experience, they begin to show their shortcoming rather quickly, in some instances have almost fallen apart in a short period of time. You might have to pay a lot more, but they will certainly offer an increased lifespan compared to their budget competitors. 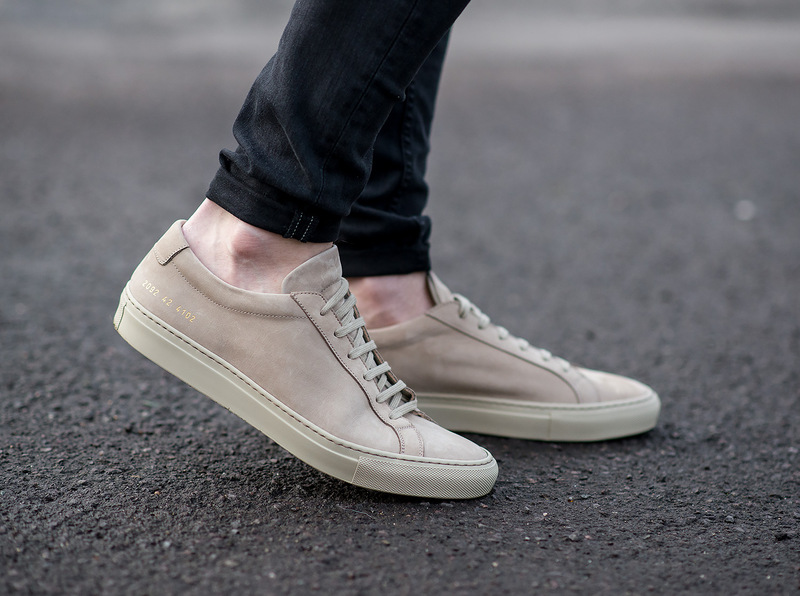 For my final verdict, I would personally recommend a pair of Common Projects Achilles Low Top Sneakers just on style and design alone. Yes, there are some comfort issues, but they are no more guilty than numerous other premium brands on the market. I would personally give them a try, even better if you manage to snag a pair in the sale! Where did you purchase these and exactly what color are they. I am seeing both off white and beige as separate color ways. Hi John, I got these last year, I believe they are long sold out now in this particular colour. Although you can still variants, such as beige, tan, off-white etc.